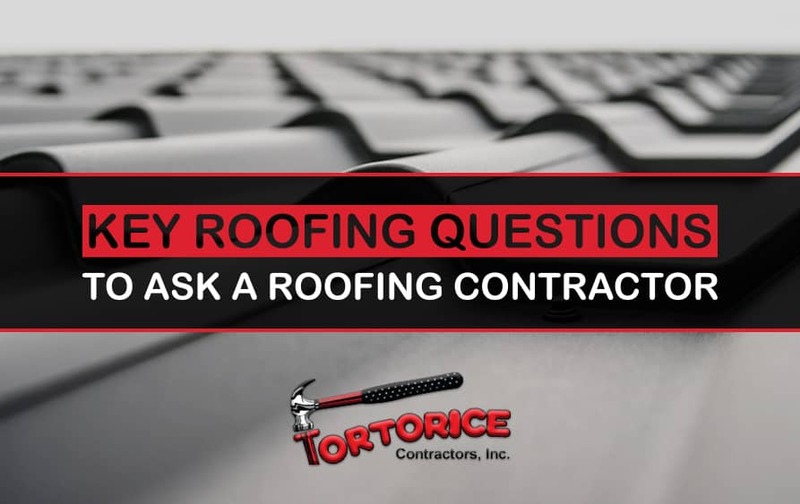 Key Roofing Questions to Ask a Gloucester Roofing Township Contractor - Tortorice Contractors Inc.
Roofing is a key part of the building process that must be handled with caution and the utmost professionalism. As a homeowner, calling an expert Gloucester Township roofing contractor should be one of your main priorities in order to ensure the entire project meets professional standards. Remember, when your roof is done haphazardly, all the occupants of your house will be exposed to many risks which can be life-threatening. We’ve heard of many unfortunate incidents where house occupants have been injured or even killed because of roofing negligence and poorly installed roofs. In addition, if your roof isn’t properly installed, it can cave in and cause massive damage to your property. Roofing is a sensitive project that you cannot afford to approach with ignorance or guesses as the implications are serious. One of the best ways to ensure you get the best value for your money and stay in a house whose roof was installed professionally is to find an expert roofing contractor for advisory purposes. Most people tend to think an expert should only be called when the process of roofing is about to begin. However, it’s always a good idea to have an expert attend to your project from the start as this gives you the opportunity to engage with them, and ask pertinent roofing questions. This means that when looking for a roofing contractor, you need to research extensively and find the right professional who has worked on numerous projects and who knows what they are doing. As long as you’re working with a reputable roofing contractor in Gloucester Township you can rest assured that all of your concerns will be addressed professionally. Never hesitate to ask a question, even if the answer seems obvious. In roofing, every detail, no matter how small it might be, holds a lot of significance for the project, and if not addressed, can compromise the entire roofing exercise. So, what are some of the key questions you should ask your roof installer? What Is the Total Cost of the Entire Project? There are various types of roofing expenses you will incur depending on the nature of the project. For instance, if you simply want to repair your roof the costs will not be same as if you replaced your entire roof or built a completely new one. Regardless of what you intend to do, it is essential to get an exact estimate in advance in order to have a good idea of how much you will spend on the project. If you start the roofing project without knowing how much is expected of you financially will be a grave mistake because chances are high that you will encounter costs that will fall outside your budget provisions. In most cases, projects which are not well planned in advance never usually are finished or the quality ends up being compromised because of the need to cut down on costs. However, when you consult your roof installer they will be in a better position to analyze your roofing needs and provide an accurate budget for you. Alternatively, if you have your own budget, you can share it with your roofing contractor Gloucester Township expert who can then advise you on how to get the best roof that will effectively cater to your needs. What Roofing Type Will Best Meet My Needs? There are many different types of roofs on the market you can choose from. Remember, roof installation is not just about picking any type of roof and having it installed on your house. This process demands technical evaluation and an accurate determination of your needs, as well as to find which roofs are best suited for the task. One of the key roles of a roofing installer is to help property owners identify the most appropriate roof for their home. Because they usually have been in the profession for a long time, roofing contractors have worked on diverse projects and therefore understand under what circumstances various types of roofs should be installed. For instance, they’ll consider a number of issues such as safety and prevailing weather conditions before selecting the type and roofing design that will best fit your home’s needs. Discussing your requirements with a Gloucester Township roofing contractor is the best way for them to help you get the most appropriate roof for your home. How Do You Intend to Manage the Project? Even though some property owners fail to ask this question it is an important one to ask because it helps you understand the approach they intend to use. One of the key questions that you should ask is how long the project will take. Roofing exercises all adhere to specific timelines and a reputable roofing installer should be able to tell you when the work will be completed. In addition, based on the type of the roof that is going to be installed, your Gloucester Township roofing contractor should brief you on what kind of materials will be required for the work. You should check to see whether your roofing installer has the required equipment and whether they intend to bring it to the site.